Our favorite portrait of Aunt Dorothy on her little farm in Nunn. I had to say the hardest of goodbyes this week. Goodbye to someone I dearly love and won’t see again in this life. It didn’t make it any easier. We’ve had some interesting conversations (we’ve always had interesting conversations), but last Sunday’s was different. Sunday she didn’t ask me when I was coming back. She didn’t ask me to bring her anything. She did ask me to make sure I used a nice picture of her for the paper, and if I had picked up the dress she wanted to be buried in from the cleaners. Did I mention that Aunt Dorothy has always been a practical woman? And at the end, she told me that she loved me and that she would see me again someday, and assured me that she would never forget me. And we talked about other things that I will keep close to my heart. And then she asked me for one more hug and kiss. This is not my first rodeo. I’ve been down this road before. But it really never does get easier. I think and reflect on our recent conversations and our relationship. I have known Aunt Dorothy nearly 28 years. My husband, of course, has known her his entire life. After all, she is his father’s sister and I am only her family through the blessing of marriage. 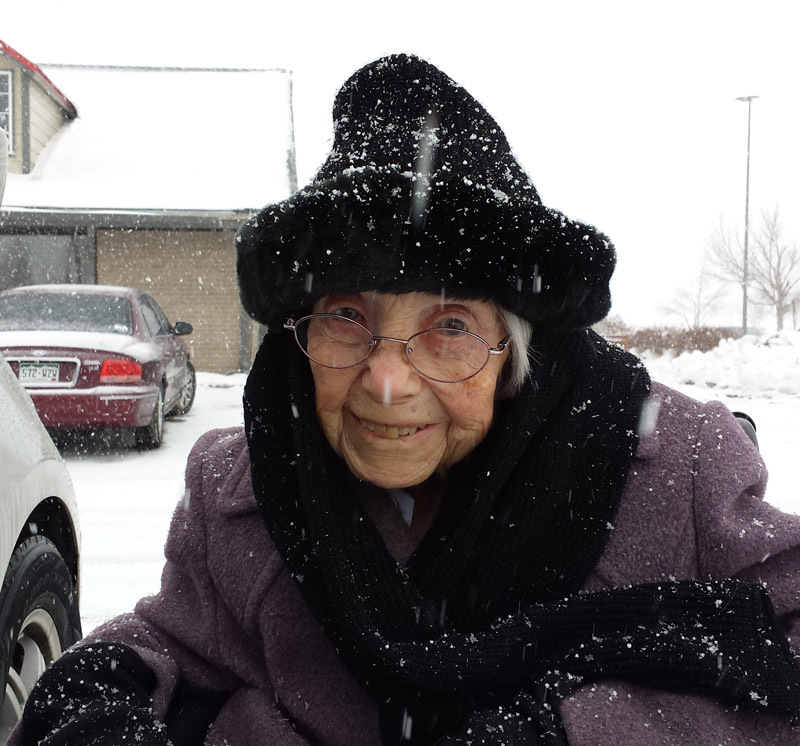 Our last outing with Aunt Dorothy in January–completely undaunted by the snow, she was up for lunch at her favorite restaurant–Golden Corral–and shopping at WalMart. The thing that makes it all bearable is the knowledge that our last conversation was all truth. I know that I will see her again. And I know that when I do she will still be my aunt and I will still be her niece and we will have the same relationship we have now. And from our conversations and things that she has shared with me this week, I believe she now knows that as well. I’ve thought much about the sadness of death this week. I am not sad for Aunt Dorothy. Life has been hard for her the last couple of years. 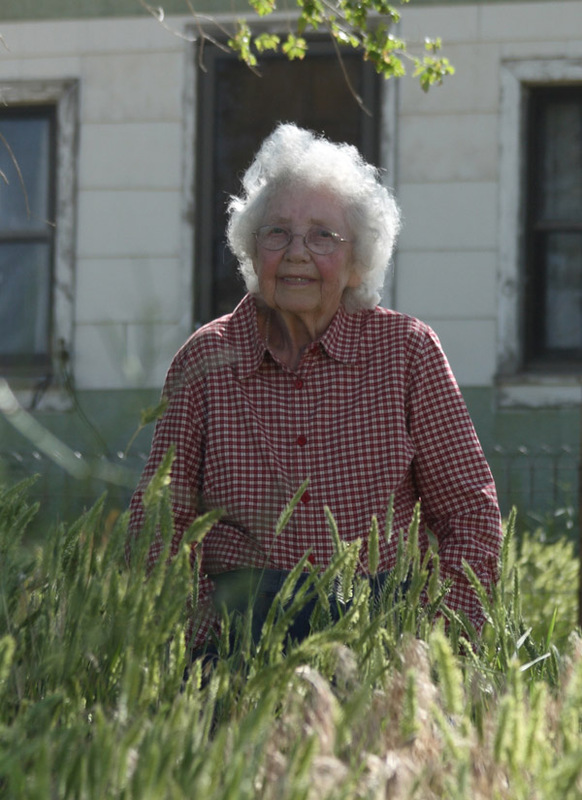 An injury from which she never fully recovered signaled the end of her time living independently in her little farm house in Nunn, the one she and her husband built 65 years ago. The last few weeks have been even harder on her. Now she has no pain. She is no longer limited by the frailties of her body. She has had what I am certain was a glorious reunion with her husband, her brothers, her parents and other assorted family members I know she has missed. No, I am not sad for her at all. I am sad for me. I began to miss her even before she was gone. I miss the adventures we can no longer have together, the shopping trips and lunches out that we both enjoyed so much. Ok, she enjoyed our excursions to WalMart a lot more than I did—but the rest of it was good. And she always had great stories. Right until the very end her mind and her memory remained sharp. We could drive out along old prairie roads and she could tell us everything about who had lived on which farm and who their children were and what they did. We spent one summer scanning old family photos together. I scanned them in and then she told me all about the people and places in them so we could record them for her family history. Yes, I am definitely sad for me and for our family because we all miss her and forever seems a long way off right now. But I know that missing her won’t last forever because I know that families are forever. So, until we meet again, I love you too, Aunt Dorothy.